The 2018 Volkswagen Atlas is an all-new three-row SUV that is being designed and built right here in the U.S. and has been created specifically to meet US consumer tastes. While the Touareg SUV has been around for quite a while, it does not offer a third row of seats. Not only does the Atlas compete with its competitors in terms of value, but it offers the type of spacious interior the average American family is looking for in a crossover SUV. What’s New in the VW Atlas? Everything from bumper to bumper, as the 2018 Volkswagen Atlas is a brand-new model being offered for the first time. While it is intended to fit in between the compact Tiguan and the top-of-the-line Touareg, you will find it is actually bigger than the Touareg but with a different level of features and options. It is available with a four-cylinder or V6 engine and front-wheel drive. Those who opt for the V6 can also get all-wheel drive for more traction. The Atlas comes in five trim levels with the first four being offered with a 2.0-liter four-cylinder engine that is rated at 235 horsepower and 258 pound-feet of torque. Optionally, you can replace the four-cylinder engine with a 3.6-liter V6 engine that is rated at 276 horsepower and 266 pound-feet of torque. This engine comes standard in the SEL Premium trim. All models are offered with front-wheel drive with the four-cylinder engine. You can add all-wheel drive to those equipped with the V6, it is, however, standard on SEL Premium models. All trim levels come with an eight-speed automatic transmission. This transmission offers silky-smooth shifting and good acceleration off the line. Inside the Atlas, you will find a comfortable and spacious interior with room for adults in all three rows of seating. As you might expect from this legendary German automaker, the interior features top grade materials but does not feature many of the gimmicks seen in other vehicles in its class. What you will find is a standard shifter along with easy to use menus on the infotainment screen and controls that are as easy to reach as they are to use. A 6.5-inch touchscreen is standard on all models and features an interface that works with Android Auto and Apple CarPlay. It also offers full Bluetooth connectivity that lets you stream your favorite music. Among the many other options available for this all-new crossover are a power liftgate, automatic tri-zone climate control, adaptive cruise control, automatic emergency braking, an upgraded 8-inch touchscreen, parking assist, and the Volkswagen Digital Cockpit that adds a configurable video screen to the instrument cluster. You can program this display to show things like speed, fuel, temperature, and more to help keep you fully informed on the road. 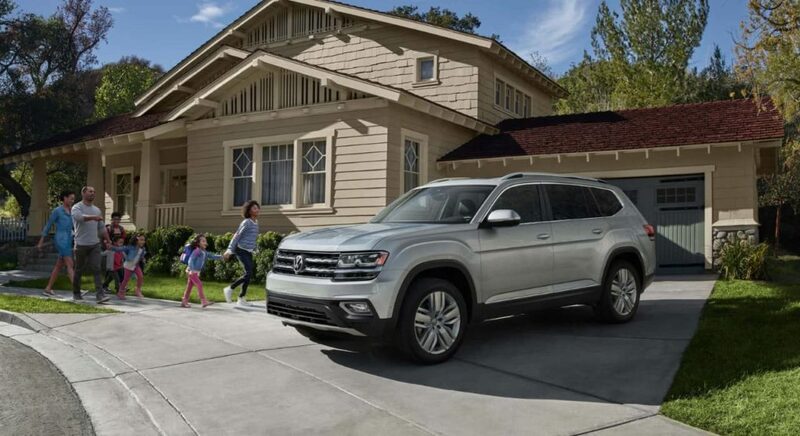 To find out more about the all-new 2018 Volkswagen Atlas, contact a member of the professional sales team at Durham Volkswagen. Call us at (919) 493-7411 and let our team fill you in on the details or send you a brochure so you can see for yourself all that this new addition to the Volkswagen family has in store for you.